When economists talk about The Cost of Living by State, they are usually referring to how much it costs to live in one state, as compared to how much it costs to live in another state. Necessities like food, housing, utilities and transportation expenses are all considered when actuaries perform Cost of Living calculations. The numbers shown below indicate a state's ranking, as compared to other states, in terms of cost of living (COL) during the 2013, 2014, and 2017. Lower numbers are better for cost of living. 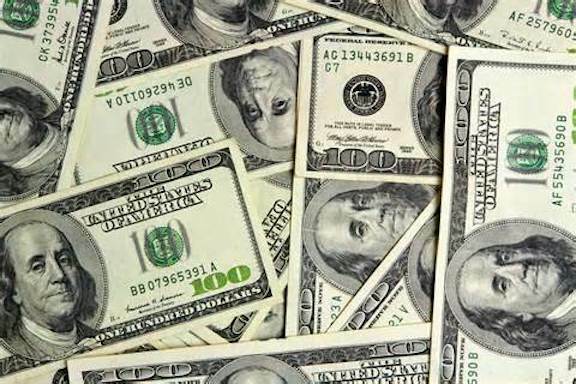 The cost of living is generally measured in terms of the average price paid for housing, utilities, groceries, healthcare, transportation, and miscellaneous expenses. This average is then adjusted according to the prices of products and services in the area. The data shown below was compiled from collected stats found in the Federal Cost of Living Index at the Bureau of Labor Statistics, and on various official economic websites pertaining to each individual state. For the purpose of understanding this type of list, the national average cost of living is fixed at 100. 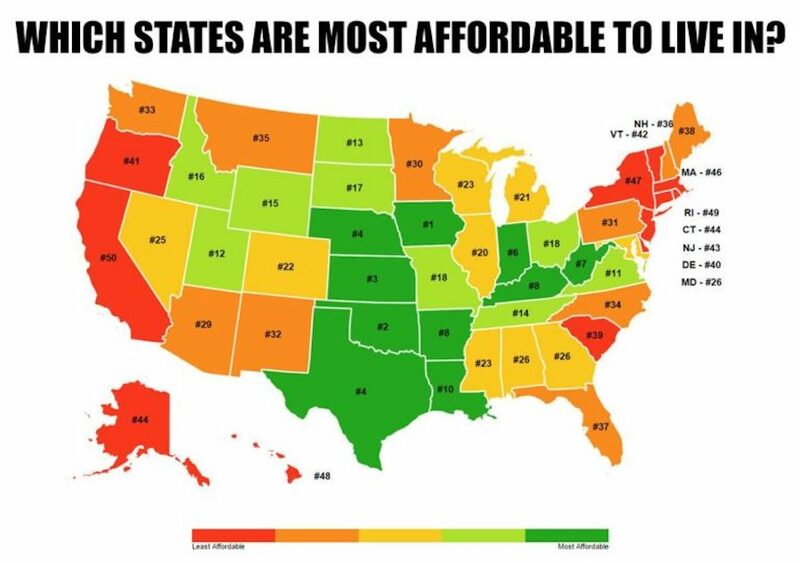 So, you can't tell exactly how much it costs to live somewhere, but you can see how much states deviate from the national average, and from each other. States are listed alphabetically on this page. Below the data is a generalized U.S. map that provides a visual representation of the approximate cost of living in each state. For more United States demographics and other economic info, visit any of the links shown on this page. Shown below: Another, more detailed U.S. Cost of Living map. This one provides state rankings. 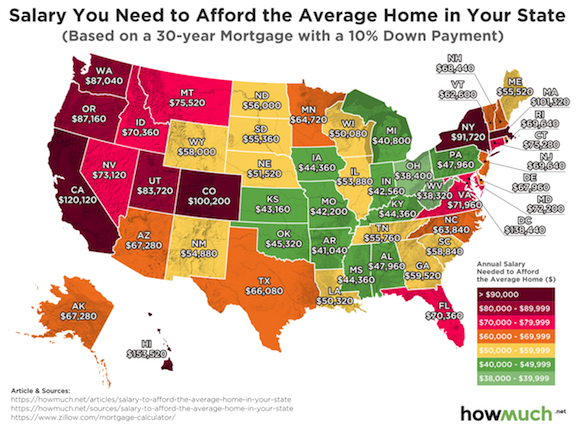 Shown below: Another cost map showing the salary required to buy an average priced home in every state. 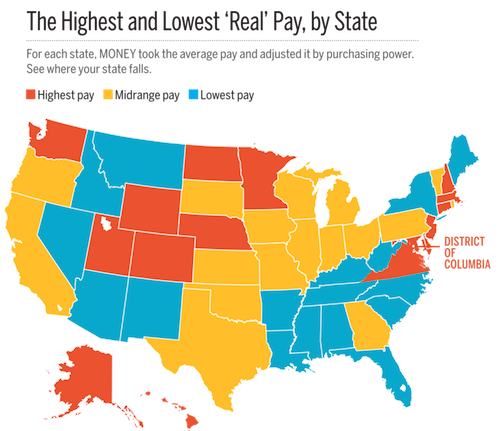 Click here for more information on the Cost of Living by State. Look here for kids women & Men Clothing Store locations at Premium Factory Outlets in All 50 States.